Welcome to study the module of small groups in learning! Here is a structure for the self-study of this module. a) Draw your lifeline on a paper. Mark the 3-5 most significant experiences as a teacher on the lifeline - positive or negative. Describe them in writing. HOW DOES THIS RELATE TO THE SMALL GROUPS IN LEARNING??? b) Write a short reflection on experiences as facilitating small group learning and/or being a learner in a small group. What are the main points or key elements that you can find in your experience? Bion, W. R. 1961. Experiences in groups and other papers. London: Routledge. Borg, M., Kembro, J., Pedersen Notandera, J., Petersson, C., Ohlsson, L. 2011. 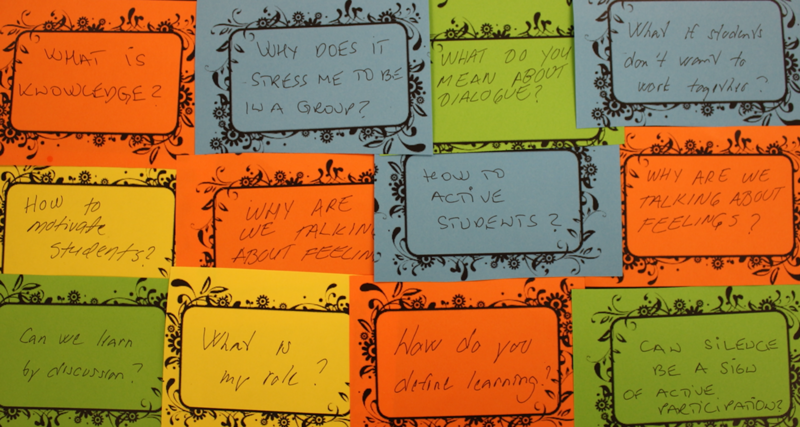 Conflict Management in Student Groups - a Teacher’s Perspective in Higher Education. Högre utbildning, 1 (2), 111-124. Brookfield, S. 2006. The skillful teacher: on technique, trust, and responsiveness in the classroom. San Francisco: Jossey-Bass. Burke, A. 2011. Group Work: How to Use Groups Effectively. The Journal of Effective Teaching, 11 (2), 87-95. Davidson, N., Major, C. H. & Michaelsen, L. K. 2014. Small-group learning in higher education—cooperative, collaborative, problem-based, and team-based learning: An introduction by the guest editors. Journal on Excellence in College Teaching 25 (3&4), 1-6. Estébanez, R. P. 2017. An Approachment to Cooperative Learning in Higher Education: Comparative Study of Teaching Methods in Engineering. EURASIA Journal of Mathematics Science and Technology Education, 13 (5), 1331-1340. Haapaniemi, R. & Raina, L. 2014. Rakenna oppiva ryhmä. Pedagogisen viihtymisen käsikirja. Jyväskylä: PS-kustannus. Kopakkala, A. 2011. Porukka, jengi, tiimi. Ryhmädynamiikka ja siihen vaikuttaminen. Helsinki. Mills, D. & Alexander, P. 2013. 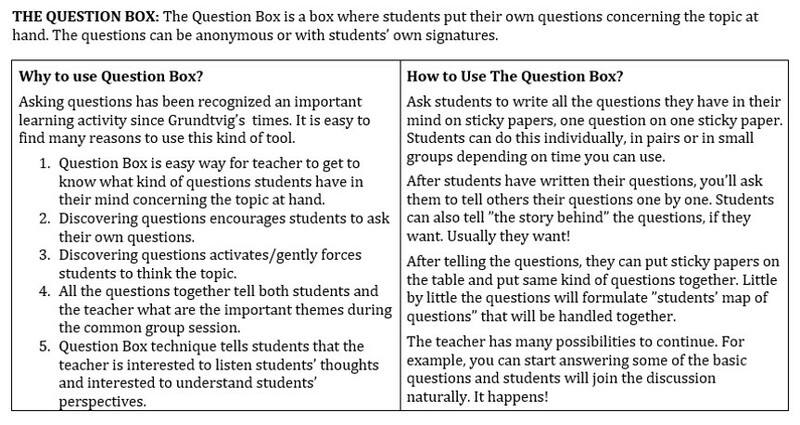 Small group teaching: a toolkit for learning. The Higher Education Academy. Niemistö, R. 1998. Ryhmän luovuus ja kehitysehdot. Tampere: Tammerpaino. Nikkola, T. 2011. Oppimisen esteet ja mahdollisuudet ryhmässä. Syyllisyyden kehittyminen syntipukki-ilmiöksi opiskeluryhmässä ohjaajan tulkitsemana. Jyväskylä Studies in Education, Psychology and Social Research 422. Nummenmaa, A. R. & Lautamatti, L. 2004. Ohjaajana opinnäytetöiden työprosesseissa. Ryhmäohjauksen käytäntöä ja teoriaa. Tampere: Tampere University Press. Repo-Kaarento, S. 2007. Innostu ryhmästä. Helsinki: Kansanvalistusseura. Topping, K. J. 2005. Trends in Peer Learning. Educational psychology, 25 (6), 631-645. Topping, K. J. 2005. Trends in Peer Learning. Educational psychology, 25 (6), 631-645. Contact your own University for information regarding guided studies based on the materials. Specialists: Anita Malinen, University of Jyväskylä, Juha Lahti, University of Jyväskylä, Terhi Skaniakos, University of Jyväskylä. Video and audio production: Kari Toiviainen, University of Jyväskylä, Ville Vester, University of Jyväskylä.